Yesterday I told you that you should try a custard apple because it’s wonderful and you’d be a fool not to love it. I also advocated the trying of any food that’s new to you. That includes foods that may have somewhat of a reputation, like durian. I first learned about durian a few years ago and it seemed that nothing I heard about it was positive. I recall reading a description of the smell by Anthony Bourdain where he said "Try leaving cheese and a dead body out in the sun and you're in the same neighborhood as the smell of durian." Now if that doesn’t have you running out to try this fruit, I don’t know what will. It actually really did pique my curiosity. If this thing was so foul, why do people eat it? And what’s more, why do they love it? Bourdain actually went on to praise the fruit, despite it’s repulsive scent. I had to find out for myself, but I was afraid. I’d heard stories of countries banning durian on public transportation because the smell was so awful. I’d read that if you opened a durian in your kitchen you’d be smelling it for days on end and that the smell would drive you to want to sell your house and move across the country. Did I really want to willingly bring a durian into my house? It took me quite a while to work up the courage to do so. I frequently passed by the durians in Chinatown and would stare at them with a furrowed brow, wondering how that spiky fruit could be the centre of such controversy. It didn’t look so bad just sitting there, a little awkward perhaps and a bit like a porcupine. But everyday I would ultimately pass by the durians, deciding it would be best for another time. Eventually an opportunity presented itself to me that I couldn’t refuse. I had a project to do for school that involved visiting some sort of food institution and reporting back to the class on my findings. I chose the rather broad topic of Chinatown and showcased a variety of interesting and unusual items that can be found there. It was finally time to try durian. I bought one, had it wrapped in newspaper so that I could carry it home without t puncturing my skin with its spikes and I was on my way. The journey from Chinatown to my kitchen went smoothly enough and I couldn’t detect any horribly offensive odour emanating from my grocery bag. And I even survived cutting it open and taking my first bite. Following that I was more confused than anything. Durian is certainly unlike any fruit I have ever tasted before, (I felt like I was somehow eating a cooked food, the texture was bizarre) but I’m not sure what all the hype is about. I didn’t love it but I didn’t hate it either. I’ve heard a few different hypotheses on why this was so. One person told me that the evil smell of durian is only unleashed in the cooking process so by eating it raw I was avoiding the worst of it. But that wouldn’t justify entire countries banning durian on public transportation. Another person suggested that maybe durian was like cilantro in that some people had serious aversions to the smell of it while other people are not bothered by it in the least. Whatever the reason may be, my experience with durian was not as climactic as I was led to believe it would be. Nevertheless, at least I tried something new and can cross durian off my list of foods I have yet to try. Has anyone out there had a really horrible or really terrific experience with durian? I want to know! Posted by Brilynn at 1:53 a.m.
Well... I haven't tried it yet. I'm just like you: I've heard about it a couple of years ago, and still can't build the courage to buy the one staring at me in the chinese store close to my place. But then again... I'm known to have a nose that smells a mosquito in heat from miles away... so, would it be such a great idea? I don't know. It saddens me though, for again like you, I challenge myself to try new things regularly. Hiya:) I come from Singapore, and all I can say is: I think you got a dud. *Haha* Personally, I HATE the stuff. This is a fruit that garners extreme reactions. Most people I know gush about the durian's just-right sweetness, its creamy texture. You either love it or you run away screaming. When I was still living at home, my parents had to eat it while I was gone, so they won't have to hear me whine about the stink (yup, I was one irritating brat). Whenever they did that though, I would come home still get a blast of that inimitable smell. It's supposed to be that pungent. Like all fruit, you can pick bad/good ones. In Singapore we have a tough time getting good strawberries. I supposed it would be difficult to get good durian in Canada.. Good on you for being adventurous:) Cheers. I too tried this after A.B. description of it. I gagged. It was not good. When we were traveling in Malaysia years ago, we checked into our first hotel on the East Coast, and there was a sign in the room "No durian in the room." We thought that very odd. But next hotel, same thing. And on and on. Then we tried a taste of durian at a street stall. Awful! And then, thinking we must have got a dud, we had some durian ice cream at a night market. Awful! Now I give them a very wide berth at the Asian market. Bri, I think you got a dud too. The durians were immediately noticeable when I went to the Super 88 in Boston's Chinatown. I once held my nose and tried a bit when it was offered to me by three amused gentleman at the Super 88. It was wretched. I just couldn't get past the smell. The hotel I stay at when I'm in KL also has a "no durian" rule. I have been dying to try durian. I recently had a durian milkshake, but the flavor was pretty bland, so I'm thinking there wasn't much durian in that milkshake. One of these days though... I'm going to try this. I've never had it. I can't say I would absolutely not try it if someone had it in front of me offering, but I'm betting that I won't seek one out! Thanks for a great post there Brilynn. I too have been facinated by the idea of durain, I've never actually come across it, but I have a hunch that an ethnic shop I went to once had it, because the smell was seriously rank! but we had such communication issues that it was beyond trying to ask. I am a teacher and many of my students are Cambodian. Durian is a favorite in Cambodia. One of my former students brought durian to my house when he visited. The smell was absolutely repulsive to me. He had to remove it from my house. Even after it was gone, I could still smell it. One day, I walked into my classroom and I smelled the foul smell that is durian. I immediately wanted to know where it was coming from. One of my sweet students just had a durian flavored hard candy, but that was enough to send me over the edge. btw, many Cambodian students have also told me they find the smell distasteful. I'm another one who hasn't tried it, is intrigued by it, but probably wouldn't get past the smell to try it. There are some Filipino dishes my family has made that I just couldn't try due to the smell so I figure I'd be the same with Durian. Another fruit I've never seen, but I have heard all the same stories you heard. And I have a friend who tried to order a durian bubble tea in our Chinatown one day and had the chef come out to talk her out of it. Seems he didn't want the smell in his kitchen that day. He was so persistent that she eventually chose something else, which she regrets. So thats it? I have been curious about this fruit. After reading this I still have to satisfy my curiosity if I can ever find it. Your brave. How bad can the smell be? I'm actually a fan of durian and in my experience it is possible to buy durians of varying pungency. I think they are bred that way. Durian will be the first thing I seek out on my next trip to Thailand. I love it. I love it fresh; I love it preserved; I love the candy. I love the wonderfully soft, silky texture inside a thin skin. The smell can be strong, but IMO aging strawberries or aging bananas smell way worse. Haha..I like Anthony Bourdain's quote! Well, even after hearing that you were brave enough to try it. Impressive! hehe. I had a bite of it once when i was in Hong Kong and my impression was the same. I didn't love it and i didn't hate it either. I agree with you. I was in Thailand for a couple of weeks, and ate it fresh from street vendors several times. I didn't think it smelled that bad, and I also thought it wasn't that tasty. I thought the custard apples were tastier. Ooh durians! That's something i haven't had in a while. I love it but it is very much an acquired taste. Hats off to you, Bri, for trying something different! Wouldn't know where to buy one, wouldn't be brave enough to eat it. It looks very threatening. I saw both the Travel Channel segment with Andrew Zimmern (Bizarre Foods) and knew this was something I would never try nor had a desire to try. Gack! I had a Durian and was scarred for life by the memory of the smell/taste of it. We got one as a treat for our adventurous- eater Mom (who always bought us fruits we hadn't tried as a treat). I really wanted to like it. Anything that looks that deadly should be delicious! We had to bust it open with my husband's hatchet and then most of the family ran for the trees. My Mom , one sister and my husband categorically refused to try it and only one brother, one sister and myself were brave enough. Brother popped it in his mouth and promptly threw up under my tree. Sister got it 1/2" from her mouth and chickened out. I ate it and tasted it for 2 weeks (and I don't mean that in a good way.) I wonder if we just had an exceptionally pungent one. One sister, who wasn't present, was presented with a Durian birthday cake by a loving Aunt when she visited in Paris. She choked some back so as not to offend but really hates the stuff. I just had durian the other day and it tastes much better outside because of the air circulation! 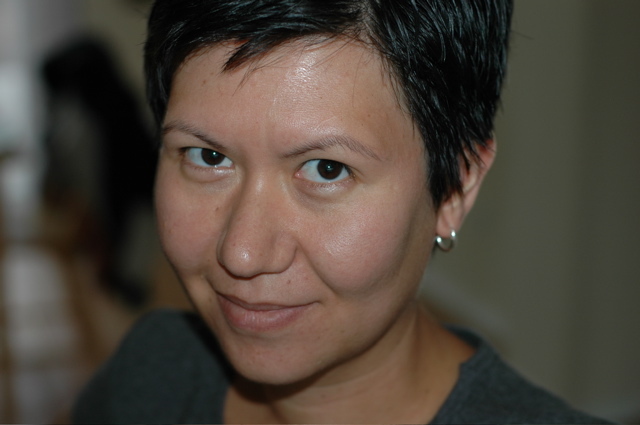 Most of my elder Viet friends and family LOVE it, but my younger friends find it revolting! Hah! The separation of generations certainly can have difference of opinions! I'm glad you shared it with everyone and gave them a great education on durian! I've never even seen a Durian (or a Custard Apple for that matter) so I've no idea how I'd react. But I have heard not everyone has the same reaction to it so it's quite intriguing. How very brave of you to try this gold fruit! This is our favourite fruit in Singapore. We have a local saying "Pawn the sarong and eat durians". During the late sixties where majority of the population was very poor, the urge for durians was so great that the head of family will take the sarong (batik cloth worn as skirt passed down from older generations and considered as antique) and pawn it to buy durians. 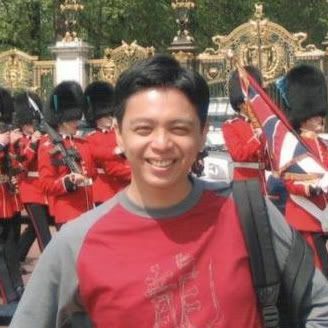 Hi, Chris from Singapore. Our favourite fruit and a saying goes "pawn the sarong and eat durians". Kudos to you for having the guts to try this! I found it pretty hard to believe 90% of the ppl here are grossed out by durians. I live in Malaysia with some sort of tradition for durian parties in a home or the backyard where we gobble up a mountain of durians whilst chitchatting the night away, and possibly getting sick later coz durians are very heaty fruit. But for the sake of creamy goodness, to hell with it. 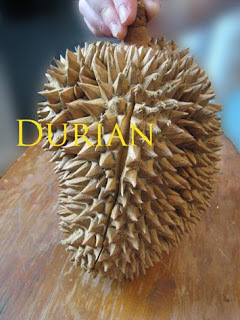 I love-hated durians when i was little. REFUSED to touch durian flesh coz the smell would linger up to a week...so I made my mom hold the fruit for me while I nibbled! Oh pandan leaves help to get rid of the smell, btw. Simply tie em in bunches and leave em around any stinked up spaces. Try dry charcoal too. When I was young, the men in my family would get all excited come durian season. Back then, the best durians would always be a milion miles from civilization. I'd get excited for another reason; durian season meant that mangosteens were also available! Durian is the best fruit on the entire planet (along with mangosteen). I avoided it my whole life until high school, when an ounce of bravery spurred me to dig in. I've been hooked since. My whole family has always been into it (two years ago my dad had a "durian party" with fresh fruit, crepes with durian jam topped with durian ice cream), thus I'm used to the smell. I must say though that most exported durian (especially frozen ones) range from subpar to disgusting. The best ones I've tasted were ones fresh off the tree. The worst was in SF Chinatown, out of some freezer. In fact, I hardly ever eat durian if I don't know the grower. It's way to expensive here to even risk getting a bad one... and there are many. Durian here in the US is pretty mild in taste and smell compare to the one from Malaysia or Singapore.I guess is because its from Thailand has been frozen for a long time. I am from Malaysia and I find our durian is much better than the frozen one here because it taste better and stronger smell. Like you said you either love it or hate it. I just love it !!! hrmmmm i'm from singapore too and durian, i really don't like it, so you're not alone! haha and we're the ones that have a ban on durian on public transport. 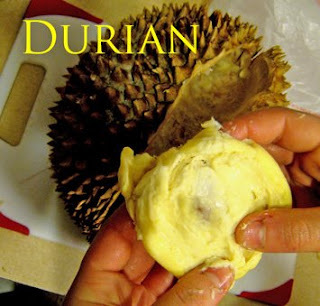 maybe like some other readers suggested, the durians in canada could have come from a different source and frozen, that's why the smell isn't as pungent. i've had my uncle eat durian after having dinner out with his friends and when he came home at about 9, i could smell the durian. and once he brought durian home during dinner time when i was out and when i came home at 10 and no traces of durian was visible (the leftovers were all wrapped in triple plastic bags in the freezer) i could still smell the durian. i've known friends and family that totally loves durian but not me. btw, you don't really have to cut it open you know. we pry it open because there are segments of the durian (somewhat like an orange) and you just have to arm yourself with a kitchen towel and a knife. steady the durian with 1 hand an the towel and pry the durian open from the bottom with a knife. also, it's said that to remove the odour of durian from your fingers, fill the empty shells with water and wash your hands with it. and because durian is supposedly "heaty" (it's easy to get a sore throat from eating too much durian), drink water using the empty shell as a cup and that'll prevent the sore throat. I'm one of those people who absolutely love durian. My parents ate it and stank up the house for years before I tried it. I didn't like it the first few times, but they insisted so I kept eating it and now I think I like it more than they do :D. I suppose it's kind of like stronger cheeses. It can take a while to get used to the smell and the taste, but once you start liking it you'll never look back. You need to take a trip down to Malaysia for an authentic durian extravaganza :) Sounds like the exported durians don't do any justice to the fresh fruit we get. Lots of people hate the smell but I reckon it's not much worse than blue cheese. To sum up, you should definitely give durians (particularly Malaysian and Sumatran varieties - Thai durians aren't as "fragrant") another shot, Brilynn! Trully it is the king of fruit if you're born to like it; otherwise, it would smell like rotten banana mixed with natural gas. I've found that only 10 or 12 percent of people who never had durian before like it at the first time of trying. I LOVE DURIAN. The King of Fruit. In Singapore, they spent 600 Millions to make their convention center look like Durian because they love it that much. It is called Durian Convention Center. Top Three in the World. A friend of my mom's brought one over one time, and I couldn't stand being in the same room as it because of the smell, and then I tried to eat it, and thought I was going to die. I got a sense of the sweet, smooth, nutty flavor of it, but combined with the smell was just unbearable. What an amazing fruit. First I thought it would be daunting to open it...so there I was with my machete ready...turns out if its just right you can easily open it by hand. The smell was strong, but wasn't disgusting or funky like descriptions I had read. Instead the durian has a fairly pleasant smell just a lot of it. The taste reminds me of vanilla custard with almonds and a dash of persimmon. Truly a king of fruits. I have had it twice and i am here to tell you it tastes just like it smells. Thanks for the article! I have eaten durian all my life and it is my favorite fruit. In the western hemisphere I know I'm a minority but plenty of folks in Asia love it. The scent is rather potent, yes, but I love the creamy texture and unique taste. It's important for people trying it for the first time to at least get the best quality durian, which should be sweet and soft.